The term pigmentation refers to the ranges of colour within the skin. Pigmentation can range from simple freckles, age spots and sun spots to large areas of discolouration like in Melasma. There are many types of pigmentation which can be caused by hormones, sun damage, trauma and genetics. There are special cells called melanocytes in the skin that make melanin, a pigment that controls the colour of our skin. The actual number of melanocytes within our skin is the same regardless of skin type, it is the production of melanin from these cells which determines skin colour. High levels of melanin cause darker skin and lower levels cause lighter skin. Hypopigmentation refers to areas of lightened skin and hyperpigmentation refers to areas of darkened skin, both are caused by altered levels of melanin. This occurs when the melanocytes are damaged or not functioning adequately, therefore affecting melanin production (either stopping production or increasing production). Triggers for melanin production such as the sun, heat, injury and hormones cause the melanin to be produced in the deep layers of the skin. The melanin then slowly rises through the layers to the skin to sometimes sit more superficially (such as freckles and sun spots). This is why some pigmentation is difficult to see and difficult to treat as it sits deep within the dermis of the skin. Melasma is a condition where the melanin can sit both superficial and deep making it much more difficult to treat. Freckles - often genetic but can be triggered by heat and sun exposure. Sunspots or solar lentigos - as a result of chronic sun exposure and sun damage. Diffuse sun damage - chronic solarium use, tanning and occupational sun exposure will cause skin colour irregularities with patches of hypo and hyperpigmentation. Age spots - these result from sun exposure and age related changes in melanin production. Melasma - multifactorial cases ranging from hormones to genetics and triggered by sun exposure. Difficult to treat but can be controlled through regular treatments. Post inflammatory hyper or hypopigmentation - PIHP can occur to the skin after a trauma, as a result of excess melanin being produced by means of protection. Sun exposure - Melanin functions to protect the skin cells from UV damage however chronic sun exposure, frequent sunburns, tanning and solarium use will result in underlying cellular changes resulting in an increase in melanin as well as the damaging effects such as reduced collagen and elastin, decreased skin laxity, poor texture, accelerated ageing and of course the risk of cancer. Trauma - trauma or injury to the skin can result in hyper or hypopigmentation. The most common is hyperpigmentation due to inflammation which in turns triggers the production of melanin as a means of protecting the skin. This is especially common in darker skin types where there is already an excess of melanin. A common cause of post inflammatory hyperpigmentation is inflammatory acne, abrasions or surgical wounds, bites, burns, incorrectly performed IPL/BBL or laser treatments (using too high setting causing heat injury to the skin - the BBL used at Youth Lab is much safer on darker skin types with less risk of PIPH) and incorrectly performed chemical peels which cause injury to the top layers of the skin. Hormones - hormone imbalances, pregnancy, breastfeeding and certain medications such as the pill can result in melasma which is an overproduction of melanin at both superficial and deep layers of the skin. Sun protection - strict sun protection and a daily broad spectrum SPF sunscreen is essential. Treatment of the underlying cause such as melasma. Topical treatment - cosmeceutical brightening and lightening creams containing ingredients which help to slow down melanin production and lighten existing pigmentation. Some ingredients include hydroquinone, retinoic acid, vitamin C and Kojic acid. Use of cosmeceutical lightening creams are needed prior to any depigmentation treatment (2 week minimum). Chemical peels - peels are a fantastic way to treat both superficial pigmentation from sun damage, deeper melasma and also post inflammatory hyperpigmentation (although with deeper peels there may be a risk of PIPH in darker skin types). We have a wide range of peels for pigmentation available at Youth Lab, suitable for all skin types and all degrees of pigmentation. Skin needling - microneedling with brightening serum infusions can help with superficial pigmentation and sun damage. Hydrafacial - this can help with exfoliation of superficial pigment as well as the infusion of antioxidants and brightening serums to inhibit melanin formation. 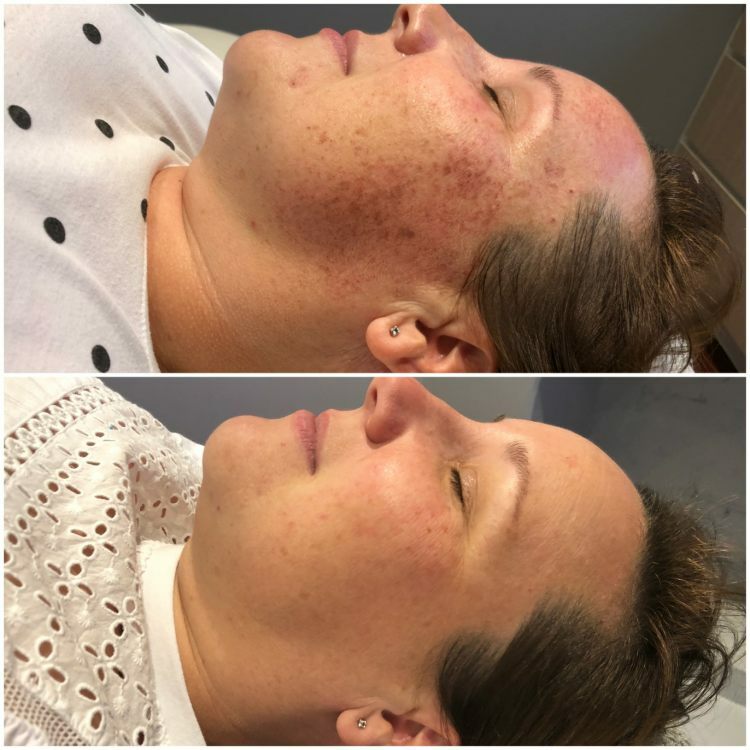 BBL / laser - the BBL system can safely and effectively treat pigmentation, freckles, sun spots, lentigos, post inflammatory hyperpigmentation, irregular skin tone and superficial hormonal pigmentation. There is always the risk of worsening pigmentation such as melasma with laser and light based treatments and we prefer to use the dermamelan and topical treatments for dermal melasma. Dermamelan - this is the gold standard of pigmentation treatment.